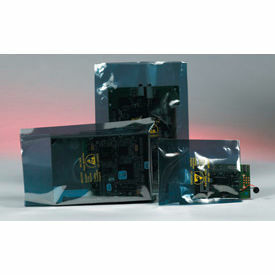 Amine-Free Transparent Anti-Static Bags Provide Superior Clarity And Performance In Low Relative Humidity. 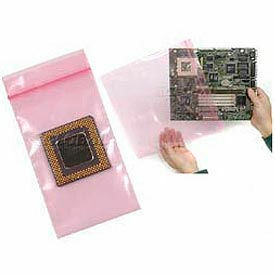 Amine-Free Transparent Anti-Static Bags have a sturdy construction for long lasting durability and strength. Features an extra strong bottom seal and a durable side weld for added strength and protection. Anti-static design ensures low resistivity. Antistatic Bags can be heat sealed, tied, stapled or taped. They meet full static decay requirements and will not corrode polycarbonate surfaces. Comes in package quantities of 50, 100, 250, 500, and 1,000. Dimensions vary per model. 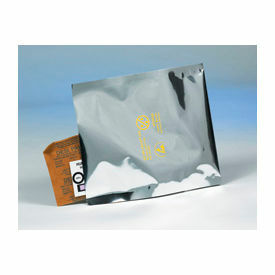 Metal-Out Static Shielding Bags Prevent Incoming Static Charges from Damaging ESD-Sensitive Products. Metal-Out Static Shielding Bags are constructed with a laminated metal outer layer required by many end users for long lasting durability. Packaging protects devices from physical damage as well as provide proper static shielding during transport. Transparent styles provide 40% light transmission that allows for identification of bag contents. Open-cell cushioning structure of cushioned bags provide physical shock protection even when punctured. Metal-out static shielding bags are tested to meet or exceed certain electrical and physical requirements. Bag thickness is 3 mil. Color is Silver. Package quantity is 100. Sizes vary per model. Resealable Metal-In Static Shielding Bags Provide 40% Light Transmission to allow for Easy Identification ff Bag Contents. 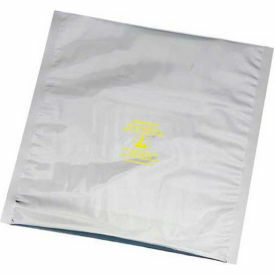 Resealable Metal-In Static Shielding Bags are commonly used for high volume manufacturing and meets limits of ANSI/ESD S541 per ANSI/ESD S20.20. Packaging is made of durable LDPE, metalized polyester, and cross linked urethane resin for long lasting use. Integral antistatic, low tribocharging properties keep contents from electrostatically charging during movement. Integral static dissipative properties are not topically treated, not humidity dependent and won't wear off. Testable to industry standards that meet or exceed electrical and physical requirements. Available package quantity is 100. Bag thickness is 3 mil. Color is Silver. Includes 1 year limited warranty. Sizes vary per model. Resealable Anti-Static Bags Keep Contents from Electrostatically Charging During Movement or Shipping to Prevent Damage. Resealable Anti-Static clear plastic packaging keeps ESD and non-ESD sensitive electronic parts free from dust and moisture for long lasting durability. Economical, reclosable and resealable with a double track, heavy-duty zipper for shipping or storing materials. Tested to industry standards for static decay requirement. 3.5 and 4 mil thickness. Available in case quantities of 100, 250, 500, and 1000. Dimensions vary per model. 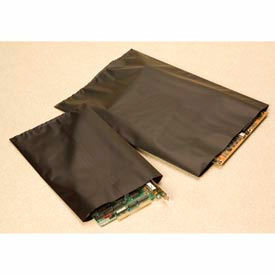 Black Conductive Bags Protect Electronic Equipment Against Electrostatic Charge. Black Conductive Bags are made of heavy duty 4 mil black carbon impregnated Low Density Polyethylene (LDPE) film to create an extra strong static barrier. Layflat bags are made with an extra strong bottom seal and durable side weld for extra strength. 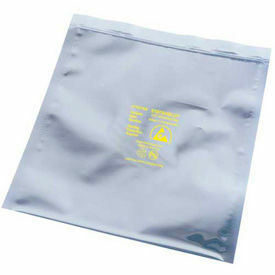 Conductive bags meet specifications of MIL-P-82646, Rev. A. Protects against electrostatic charge, chemicals, abrasion, and humidity if heat-sealed. Poly bags can be closed using heat sealers, bag ties, or twist ties (sold separately). Sold in package quantities of 100. Transparent Metallic Static Shielding Bags Offer Total Faraday Cage Protection for Sensitive Electronic Components. 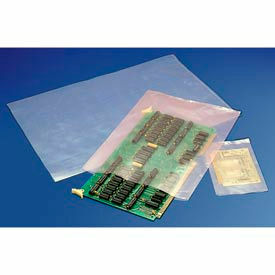 Transparent Metallic Static Shielding Bags meet the electrical and physical requirements of MIL-PRF-81705D Type III. Bags are reclosable using a finger-grip lock seal for secure closure. Guards against static charge from both inside and outside with three layers of anti-static protection. Rugged 3 and 3.2 mil bags are 50% transparent for easy product identification. Static shield bags are made with a buried metal construction using a conductive aluminum shield layer buried between 2 static dissipative polymeric plastic layers. Contains no amines, amides or N-Octanoic acid and is polycarbonate safe. Static shielding notice is stamped in yellow on each bag. Sold in package quantities of 100. Moisture Barrier Bags Provide Electrostatic Discharge Shielding And Moisture Protection For Packaging in Trays, Shipping Tubes, And Reels. Moisture Barrier Bags are manufactured from a laminate of durable metallic layers and polyethylene for long lasting puncture resistance. Strong, light-weight bags protect expensive electronic components from damage due to moisture or electrostatic discharge during transport. Suitable for vacuum packaging and nitrogen flushing. Static safe dissipative inner and outer surfaces. Thicknesses are 3.5, 3.6, 4, and 6.5 mil. Date and lot coded for tractability. Meets electrical and physical requirements of EIA583, EIA541, EIA625 and MIL-PRF-81705 Type 1. Available in package quantities of 100 and 1000. Dimensions vary per model. Open End Static Shielding Bags are used for Protecting Electronic Components from Damage Due to Electrostatic Discharge. Open End Static Shielding Bags are made using transparent metal and are printed with an ESD warning symbol and are date coded for quality control traceability. Four layer build ensures excellent protection from punctures and tears. 3.1 mil thickness. 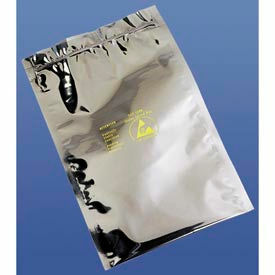 Static Shielding Bags are sold in package quantities ranging from 100 - 3000. Dimensions vary.